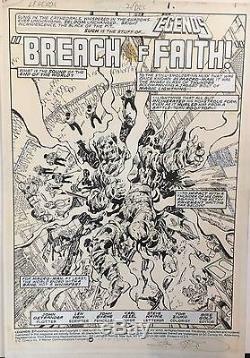 Legends #2 page 1 splash, original art by John Byrne (pencils) and Karl Kesel (inks). Published in December 1986 by DC Comics. Not an acetate copy, or "production art", but the genuine one of a kind pencil and ink artwork! Piece is on 11" X 17" art board, and in very good condition, aside from some slight tanning. Now Available for International Users. The item "LEGENDS #2 PAGE 1 SPLASH, 1986, ORIGINAL ART BY JOHN BYRNE & KARL KESEL" is in sale since Sunday, April 09, 2017. This item is in the category "Collectibles\Comics\Original Comic Art\Other Original Comic Art". The seller is "turboterri" and is located in Campbell, California. This item can be shipped worldwide.